PowerRail Distribution, a family owned and operated provider of locomotive parts and components, has selected Armstrong Steel to supply them with a custom 75 x 125 x 18 steel building which they will use as a manufacturing facility in Georgetown, Delaware. DENVER –“They were counting on Armstrong Steel Buildings for fast service and the right price on their pre-engineered steel building,” stated Ethan Chumley, President of Armstrong Steel. “Our consultants, designers, detailers and project managers listened to their needs, took their specific requirements, provided them with a design they loved and we got right to work detailing and engineering their building”. PowerRail Distribution has always been dedicated to offering its customers a better solution with cost savings, product quality and unbeatable customer service in mind. 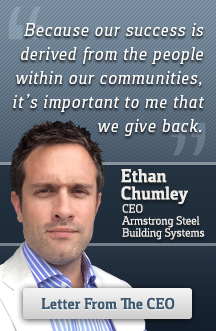 Having similar corporate principles, it’s easy to see why they selected Armstrong Steel to provide their new facility. PowerRail Distribution has been the alternative choice for quality locomotive parts and components at competitive prices since 2003. With the rail industry poised for consistent and steady growth, it’s clear why PowerRail is expanding. Armstrong Steel is always delighted to assist companies with expanding their business affordably. Paul Foster, President & CEO of Power Rail, had specific requirements for their new manufacturing facility and Armstrong Steel Buildings had no problem helping them maintain a cost effective design. Armstrong Steel’s primary goal is to make sure clients get what they need for an affordable price. “I cannot remember the last time that I received customer service like I have from Armstrong Steel. Our Armstrong Steel project manager, Jeremy, was extremely knowledgeable and assisted us at every turn. Kitty in the shipping department was on point and always had answers to our questions with respect to our scheduled delivery date. In short, everything went smoothly and you guys did everything we expected of you. I am sure that the other folks I didn’t deal with directly are just as helpful – because it seems to be a part of your company’s culture. We’d recommend Armstrong Steel to anyone building a manufacturing facility!” says William Brown, Operations Support at Power Rail Distribution. The 70x125x18 Armstrong facility is currently being erected and was designed exclusively for PowerRail. Armstrong Steel offers every customer the opportunity to design their own building and proudly delivers custom ordered high quality pre-engineered buildings all over the world. Contact Armstrong Steel today for a brochure, a building price, or to arrange for a tour of their Denver Tech Center Corporate Headquarters.